This is a 2005 Taetea Dayi raw pu erh tuo. Yes, many Chinese pu erh tea drinkers would normally associate the compressed 'tuo' (or bird nest) shape with Xiaguan tea factory. You are absolutely right that Xiaguan produces a very wide assortment of pu erh tuos every year while other pu erh tea factories often mainly produces and compressed their pu erh tea into cake or disc shapes than tuos. 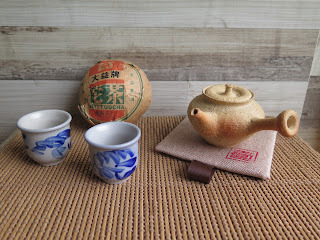 Taetea (aka Dayi) do compressed their pu erh tea into tuos on a smaller scale. This 100g 2005 raw tuo had been stored in Malaysia for about 13 years. Composed of mainly Menghai material, this tea when brewed coat the mouth easily; an almost oily mouthfeel. This tea is floral in aroma and has a pleasant mild sweet finish and aftertaste. Good for 10 infusions. But I digress. Tuos compared to cakes are more difficult to dismantle. I find that I get more tea dust after I break open a tuo. The compression of a tuo tend to be 'looser' after about more than 12 years of storage in this part of the world and the tuo becomes easier to pry open. Pu erh pressed into tuos are less popular with collectors than pu erh cakes. My guess cakes are visually more appealing, bigger and feels more value for money due to its size and weight. However, the tuo shape pu erh is a hallmark of the pu erh tea industry. 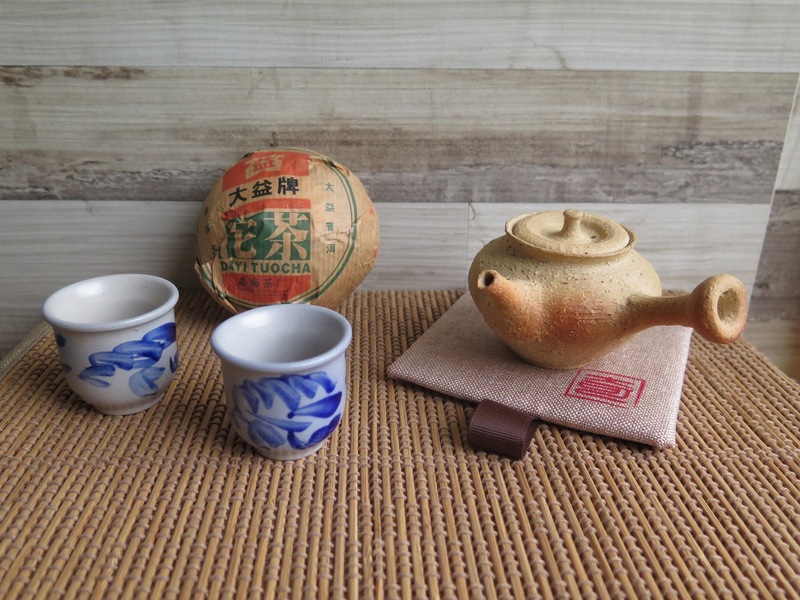 There is no discernible difference in the taste and aroma of the pu erh tea. I have yet to meet a drinker, that can tell from drinking a cup of puerh, that the tea was compressed as a tuo or not. Let me know and share your 'tuo' experiences with me. I look forward to having this Dayi tuo! I have had much younger ones from dayi, a 2011 and a 2016. They do very well in home storage compared to samples. With samples, you don't know whether to have them open, or closed. With a tuo, the porous paper makes it both open and closed. Also, it's smaller than a cake so less expensive. Get a tuo cracker from Xiaguan. What I like about Dayi is that there tuochas are somewhat less compressed compared to Xiaguan. They're a bit easier to loosen.